Grammy Winner for Best Remix in 2013 for his version of Lana Del Rey's 'Summertime Sadness'. A monthly Spotify audience of over 2.3 million listeners. Billboard, UK & ARIA Chart Top Ten Hits. Multi-platinum selling singles. Beatport, Buzz, Hype Machine & Cool Cuts Charts Number 1′s. 2 BBC Radio One Essential Mixes. 3 Essential New Tunes. A weekly Global Radio show. The go-to remixer. Acting roles in Michael Bay's blockbuster film 'Pain & Gain' alongside Mark Wahlberg and The Rock, and Pete Berg's 'The Long Night' alongside Mark Wahlberg and Kurt Russell. Residencies in Las Vegas, New York, and Miami. A yearly tour schedule & sell out shows spanning the world over. 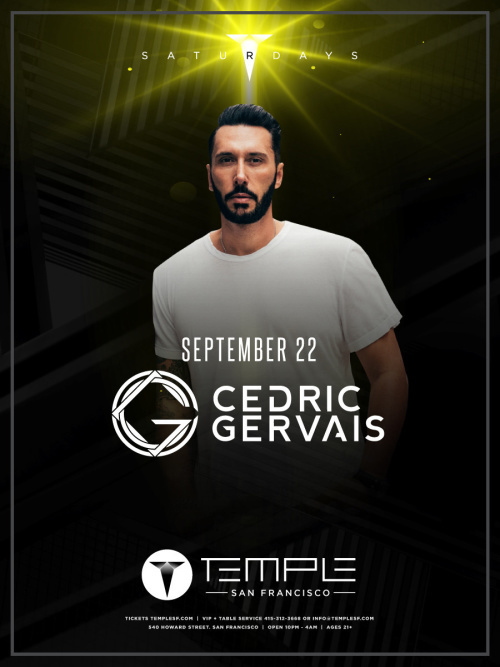 These are just a few things that have been making French-born Miami resident Cedric Gervais one of the most sought-after House DJs & electronic music producers in the world today. With the launch of his new imprint, 'Delecta Records' where he will release monthly singles, alongside a major label deal with Universal Worldwide (Polydor / Interscope) Cedric continues his ascendancy into 2016 and beyond.